What a putrid mess. Jaws 3-D has about all the care one would expect from a film that was originally pitched as Jaws 3, People 0. That’s right. This movie, the second sequel to a great film that redefined the industry’s business model, was planned as a spoof flick. Had that film been made, it would probably have been no better than Airplane II: The Sequel, but could not have been much worse than what actually came to be made. Jaws 3-D, released in 1983, follows Mike Brody (Dennis Quaid), Sherriff Martin Brody’s oldest son from the first two films. There’s a little trickery when it comes to Mike’s age in this film, as with his younger brother, Sean (John Putch). Eagle-eyed viewers will wonder how Mike is in his late twenties and Sean is in college, when, only eight years earlier, when the original Jaws was released, Mike was around twelve years old and Sean looked like he was just about ready to start elementary school. This far away from both films’ releases, it barely registers as an issue, but I remember this bugging the hell out me when I saw this movie as a kid. Anyway, Mike has made quite a career for himself. He’s an expert diver in charge of a whole lot of infrastructure at a new SeaWorld park in Florida. His girlfriend is Kay Morgan (Bess Armstrong), the park’s head marine biologist. The two of them discover that their little corner of paradise has been invaded by a great white shark that has entered the lagoon enclosure where the park’s attractions reside. Seeing as how this is a Jaws flick, in only the loosest of terms, that’s a problem for all characters involved. No more of the plot in this flick is worth going over. There’s a shark, and occasionally people who venture into the water get eaten. There’s not a whole lot of death and gore, but what there is a lot of is bad special effects. Embarrassingly bad special effects. 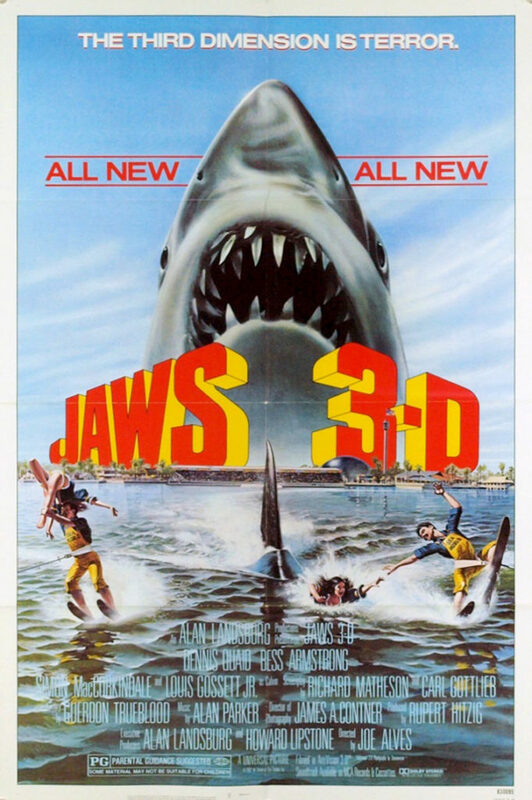 Jaws 3-D came along in a wave of 3D films in the 1980s. Every few decades studios and audiences seem to rediscover 3D and it’s a big thing for a couple of years. Then people realize that the movie experience isn’t enhanced all that much, especially for those of us who wear glasses with strong prescriptions, and the technique is filed away until there’s another breakthrough in the technology. Jaws 3-D is a case study in how not to do 3D. It’s treated as a gimmick rather than a filmmaking technique. Combined with the awful effects, there isn’t a single instance of 3D in this film that isn’t a mess. I didn’t watch the film for this review in 3D, but that didn’t matter. Director Joe Alves and his team made sure it was impossible to be confused about which shots had the most 3D. I have never seen objects composited into shots as poorly as in this movie. But the 3D and the special effects weren’t the only problem plaguing this film. It has about all the seriousness and weight of a television movie of the time. The screenplay is lousy. The only two cast members in the film with serious chops, Quaid and Louis Gossett Jr. as the park’s owner, were totally wasted on this dreck. The body count is far too low for a film of this type. Moments that are supposed to be frightening are either laughable or pitiful. Did I mention the screenplay? Because one of the credited writers was Richard Matheson, who was a giant in horror literature. What a travesty. And that’s what this film is, from top to bottom. It took a wonderful property and ground it into the dirt, all to chase dollars on the cheap. It’s actually a worse film than the widely hated follow-up, Jaws: The Revenge, and that’s saying something. It’s also worse than Alien: Resurrection. The world of cinema would have been better served if Jaws had been a one-shot deal.